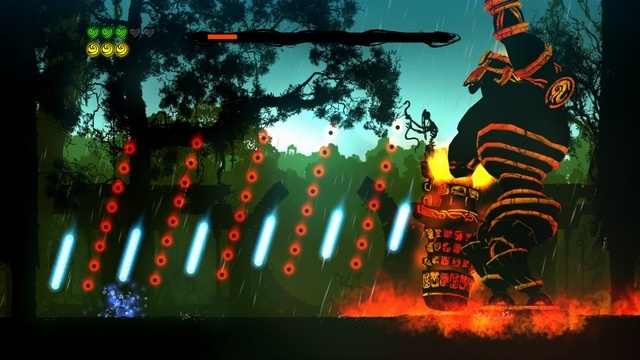 There have been a glut of side scrolling action games across both important platforms in the recent months and years. At or near the top are Shadow Complex, a game that proves you can steal everything from the founders of the genre and still have it be a good time, and Limbo, a game that is the absolute triumph of style over substance. Both of these games were excellent but missing a piece or two. Either the plot was terrible and the graphics shiny and uninspired or it used all of its good ideas up in the first thirty or so minutes and ran out of places to go. Outland surpasses both with a delicate balance between game play and presentation, exploration of story telling. It is a sublime product and easily one of the best downloadable titles to come out this year. Outland does not waste much time on exposition and motive: the world was created by sisters of opposing elements who later turned against their creation and were imprisoned by the greater gods. Eons later they are about to escape and it is your job to put them back. That's it, but it is enough to both create framework for what happens later and introduce the core game play element: color switching. This has of course been done at least once before by Ikaruga, a shooter that I never had the patience or skill to get to the end of in spite of owning it at least twice on different systems (note: this is not a bad thing). Rather than beat the player about the head and neck with screens filled with bullets like it distant cousin, Outland takes a much more subtle approach. The ability to switch between colors at will does not even become available until about thirty minutes in, giving the player plenty of time to get their hands around how the hero moves before having to worry about what color he is at the time. How the character moves is the hidden star here. 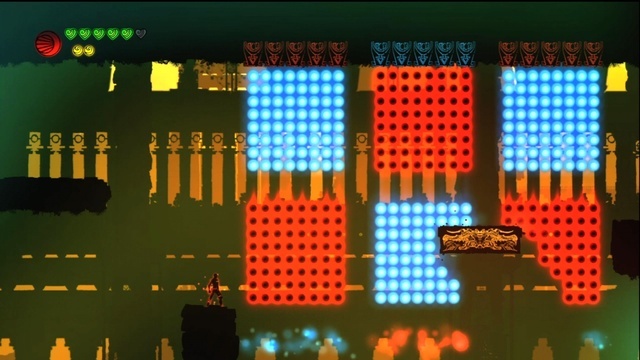 Right behind the color change mechanic and beautiful levels is hiding a side scrolling platformer with controls that rival games like N++ and Super Meat Boy in the precision of their execution. It actually makes the analog stick a suitable choice and that is not an easy thing to do. Abilities beyond changing polarity are handed out at a slow but steady pace. First there is just a melee attack, then a slide, then more and more until the player is a color shifting, double jumping, sliding machine able to traverse bullet hells that would make Perfect Cherry Blossom proud (ok, not really). It never gets as hard as it could, but that is what sequels are for. Seriously, don't worry about it. Exploration is also never as brutal or tiresome as it could be, allowing the player to focus on getting from here to there without dying instead of where to go next. Each area has a crudely detailed map and a general location you need to get to. There are also flashing lights that guide you in between them, so there is some babysitting going on, at least there would be if it wasn't guiding you across a field of bullets and monsters. It's not a guide, it's a dare. It doesn't tell you where all the secrets are, nor should it, but there enough readily accessible to get even the slowest of learners through to the end of the game. The placement and scarcity of helpful items is just like everything else in Outland: perfectly balanced. It is difficult to not gush about this game, but try as I might I cannot find much to take issue with. Checkpoints are occasionally too far apart, but even then I was rarely stuck on a section for more than an attempt or three. Bosses are exempt, with the final boss killing me just before landing the final hit not once, but twice, and two of them have lengthy intro sections that are repeated after defeat. There is an arcade mode to provide replay andcompetition to those that desire them, but they are not required. Outland was so out of the blue that I had do research on who in the world Housemarque was so I could buy more of their games. It turns out I already have: Super Stardust HD is one of the few PSN exclusives that I still play once in a while. This time around they have gone one step farther in proving that you do not need a gigantic budget and sixty hours to tell a good story by doing it in six, portraying it not with pages of bad voice acting but through the action of the game itself. This is much more than just another Metroid-vania; it is the Metroid-vania until Konami or Nintendo get off their asses and make a new ones, and even then they may not be able to reach the new bar. This blog, in its present form, is a way to force me to not game away all my free time every day in the only way I know how: talk about it instead. Also, I play a lot of crap; read about it here so you don't have to. And if the complaining starts to get out of hand, leave anonymous, hateful comments. Games don't hurt the kidneys. Much.